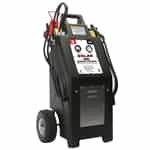 An ideal entry level 12V professional unit: features 900 peak amps, automatic charging, battery status LED’s and rotating holsters for easy clamp removal and replacement. Easy to use and lightweight, it is the ideal entry level professional jump starter. Its compact size, rugged case and ability to jump up to 5 vehicles on a single charge make the ES2500 a perfect companion for any situation in which you need portable power.